The TCX X-Miles Boot is a mid-height boot and worthy of consideration for those who like a shorter boot or have difficulty fitting a full calf. The X-Miles is full grain leather with front and rear padding for comfort, and malleolus protection for the bony prominence on each side of the ankle. The lining is waterproof with a replaceable anatomic foot-bed. The ankle impact protection includes a shift pad integrated in the sole and reinforced heel and toe counter, entry is Velcro. 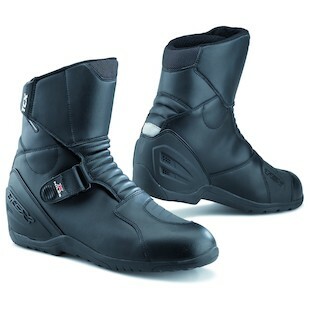 It may take longer for this boot to break in, but will be more supportive and protective in the long run..
touring or commuting choice for a rider who wants the whole package but prefers a low / mid boot.